We’d love your help. Let us know what’s wrong with this preview of Slack Tide by Vanessa Barger. Now monsters are stalking her, forcing her to decide if she will end the curse before she even really under At a time when most girls are worried about prom dresses, Lorelei Stamper is worried about losing her skin -- literally. Receiving a sealskin from her Aunt, her world is changed. Not only is she a selkie, but she holds the key to breaking a curse affecting all selkie. To ask other readers questions about Slack Tide, please sign up. Vanessa No, there isn't! Sorry I didn't answer this sooner - I missed it! Love this cover and the idea! I really, really like mythology and the ocean so a story about merpeople, selkies, gorgons, anything like that, is usually enjoyable for me. When I read the summary for Slack Tide I was fascinated by the incorporation of selkies, a prophecy, and a teenage girl. It just sounds so intriguing and I cannot wait to figure it out! I am also looking forward to the monsters stalking her, it seems to me that stories start off more interesting when the action starts while the MC is still adjusting! I really like Lorelei, she comes across as a very respectful individual but still doesn’t take crap from anyone. I wasn’t very fond of her initial cold and aloof attitude towards Declan, even though she had his best interests at heart. I loved watching her come out of her shell and realize that some people really DO think she’s worth fighting for… if she’ll let them. It was obviously a hard thing for her to comprehend and it helped me empathize with her. Throughout Slack Tide she proved herself to be a strong, selfless individual who lets her passion for those she cares about guide her decisions. Declan is a WONDERFUL character and I cannot imagine anyone better for Lorelei. He is kind and it’s obvious that he cares deeply for her. I do have a problem with a few of his tactics and some of his male arrogance but he (slowly) overcomes those faults and learns from his mistakes. I loved watching him grow and develop as a character! The other thing I absolutely love about Slack Tide is the friendships that are shown. I LOVE how Lorelei’s best friend, reacts to all the problems going on at Lorelei’s house… it’s just so genuine. Her best friend is her family, and that's how I have always thought it should be. Throughout the story frequent jokes and serious discussions show how close the two really are, and it makes the whole scary prophecy aka: "OMG someone is going to DIE" thing, seem a little less frightening. 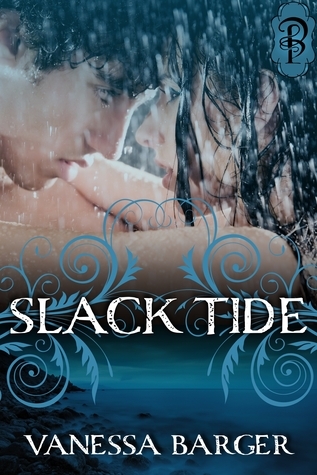 The cover does a great job of incorporating the romance and the water that take place in Slack Tide.I love how it incorporates the couple, beautiful design work around the title and then continues down to the ocean. It is really quite genius! I give Slack Tide 4.5 out of 5 hearts: Very Highly Recommended! I loved the characters, the idea of it all, and see a hint of a possible sequel in it! !